Recently I blogged about planned obsolescence and the fact that things are not made to last. I talked about buying a microwave less than two years ago and after the warranty expired, it wouldn't heat anymore. We bought a new unit because it cost less than having the old one repaired. I am mentioning this again because I have a friend who is missing her coffee grinder. I am assuming it is an electric grinder because she tried to use a blender as a substitute but it didn't work very well. I happened to have a couple very old grinders and these were meant to last. 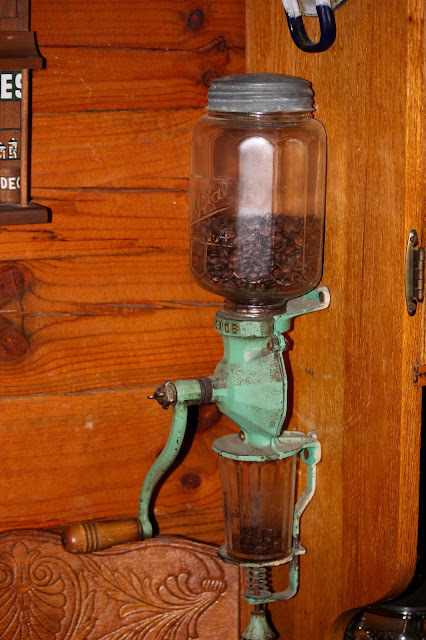 The green one with the antique dirt left on it also serves as a toy because every kid that comes to our house is compelled to turn the crank and grind a few coffee beans.